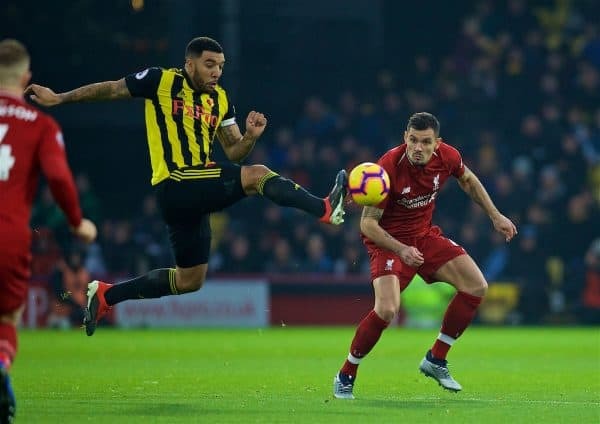 Second half goals from Mo Salah, Trent Alexander-Arnold and Roberto Firmino gave Liverpool a 3-0 win at Watford despite an unconvincing performance. With the final international break of the year out of the way, the Reds were back in action to begin a spell of 11 games in the next 40 days. On a grey November afternoon in Hertfordshire, Jurgen Klopp‘s side took to the field with two alterations from the 2-0 win over Fulham a fortnight ago, with Dejan Lovren and Jordan Henderson replacing Joe Gomez (ankle injury) and Fabinho. 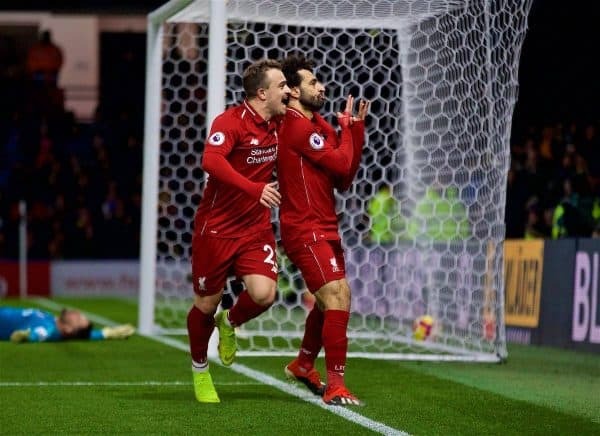 This meant the manager kept faith with his new ‘Fab Four’ of Xherdan Shaqiri, Roberto Firmino, Sadio Mane and Mohamed Salah in an – on-paper – attacking setup. The first half hour though was far from entertaining, with neither side having a shot, let alone a shot on target. The first attempt arrived on 39 minutes, with Firmino’s shot easily saved by Ben Foster. Within seconds of that attempt, Watford went down the other end and Alisson‘s superb save denied the home side the opener. The game had finally opened up and Mane then had two chances in quick succession before the break, then Salah’s header from a corner forced another save. After no chances in 38 minutes, we had five inside three minutes. The score remained goalless at the break though. The second half began by following much the same pattern as the first, but Liverpool did finally break the deadlock in the 67th minute when Salah’s close-range shot from Mane’s cross went through Foster’s legs. It was the Egyptian’s ninth goal of the season, his seventh in the league, but whether he is more effective as the No.9 or in the wide role he occupied last season remains up for debate. 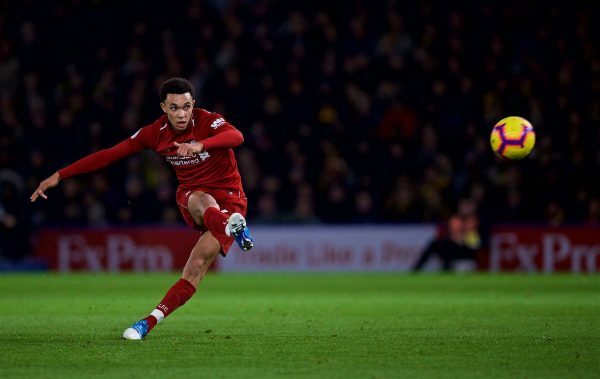 The lead was doubled when Trent Alexander-Arnold produced a superb free-kick from 25 yards, expertly curling the ball into the top corner to send the travelling Reds wild. Liverpool looked more confident and with the 4-3-3 shape restored after James Milner came on for Shaqiri, they stretched Watford‘s defence. But there was a negative with 10 minutes remaining, with Jordan Henderson sent off for a second yellow card. It was a ridiculous foul from the captain who had been warned by the ref just a minute earlier. A stupid, stupid sending off – he’ll miss next weekend’s Merseyside derby. Fabinho came on for Salah with numbers in midfield being required and Liverpool saw the game out. And Firmino added a third after good work from Robertson down the left saw Mane’s shot saved well but the Brazilian headed the ball in from close range. It was far from a vintage performance, but another win and another cleansheet keeps the Reds second in the table.